To a practicing ‘mild’ Hindu in our country, modernity presents multifarious challenges. South Africa, being a rainbow nation, is particularly, in a unique position, where society with diverse races and religious beliefs, is trying to balance tumultuous lifestyle changes with the traditional family values. How problematic ‘parenting’ can actually be is anybody’s guess. The present Post is reproduced from a booklet on ‘Parenting – A Hindu Perspective’, containing articles on many interesting Hindu ideas on parenting skills. 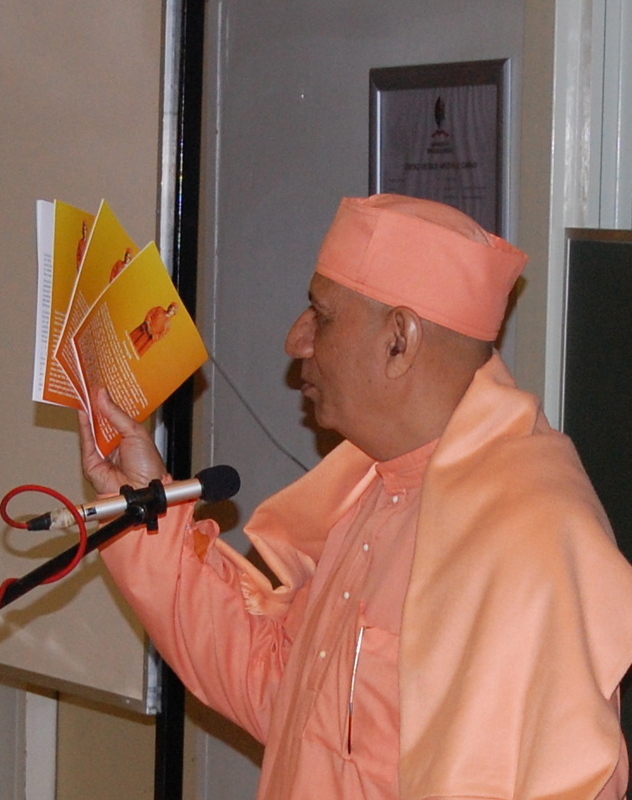 It was freely distributed to the delegates who attended a seminar hosted by Sri Sarada Devi Ashram, Asherville in commemoration of Holy Mother’s 156th birth anniversary celebration at KZN University on Sunday, 13 December 2009. It was a great success with 500 delegates from even distant places attending with enthusiasm. I was given the honour of releasing this booklet on that important occasion. My grateful thanks to Sister Pravrajika Ishtaprana mataji. First let us see the dynamics of parenting with regard to individuals who constitute a ‘family’. The adults in very many cases make themselves the focal point of their attention. Parents who are prisoners of their own predilections such as careers, extra-marital relationships, or just in their own heads all of the time, often have lonely, depressed children who doubt their parents’ love and affection. Studies have already shown a very high percentage of teens experimenting with drugs and alcohol are from homes where the parents are too self-absorbed to notice or to pay attention to what is happening with their own kids. On the other hand, let us consider the sacrificing parents whose uppermost aim is the greater good of the family. This dynamics becomes the breeding ground to resentments and underlying tensions found in most households. In their enthusiasm, the adults often give up their dream jobs, drop out of higher education, or stop having a social life outside of the family. Because, at some point along the way, it perfectly seemed to provide the probable answer to some predicament. For whatever reason, there is no time, energy, or money left for the adults even to visit temples and ashrams when all is said and done. The parents unwittingly try to become martyrs to their kids or ‘The Family’. Indeed, It is very difficult for the parents to find a healthy balance between these two extremes. Take another scenario. How many times we hear that the children should always come first – at any cost. Well, this has too a negative effect. Children who are raised to be the blue-eyed favorites, grow up to be adults with a firm belief that they have a rightful place as the center of everyone else’s universe too. Is it fair to teach the children that they are more important than everyone else? Don’t they become self-esteemed monsters and bullies? The world out there is going to teach them a very different lesson. People will not like them no matter how special Mommy and Daddy think they are. What is at stake here is everyone is equal in regards to needs, hopes, dreams, responsibilities, and other aspects of getting along in the world. Madhu’s need to jump, run and play is in no way less than Mommy’s need for mental peace. Now what happens when families start focusing on each individual’s needs, schedules, etc.? Parents are busy conducting their own lives while the teenagers are living independent lives – dropping by the house to eat and sleep, communicating only through emails or cellphones. And lo! the little ones are so busy with soccer leagues and music lessons and play ‘dates’ with their friends that they have no real sense of what family is all about. Everyone is happy, busy, flourishing individuals, but ‘The Family’ as a unit has almost completely disappeared; the inter-connection among the members of the family is absolutely lost! Is there any remedy? In comes the Hindu perspective of parenting. Though copious examples can be quoted from the vast scriptural literature, I would in brief, like to stress on the first three verses of the glorious Gita as contained in Chapter 16. These verses give us a behavioral dictum that can make every member of the family enriched with the necessary tools to face the challenge of about-turn modernity versus abiding old values. Bhagawan Sri Krishna enumerates a total of 26 noble qualities (see box) that can lead each and every one of us to be a responsible citizen of the society. The spiritual view of parenting includes not only the elaborate preparation of wedding, giving birth to children but also the manner in which the children are brought up. Children start learning from the womb. 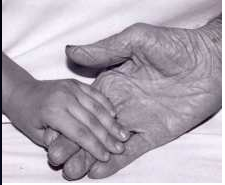 It is essential that would-be-parents adapt their life as per the 26 noble qualities. Then only they would be able to transmit them to their children. These three verses should be read on a daily basis by both parents and children and be given to byheart. Children learn by example, therefore the role of parents is vitally important in their upbringing. A home that radiates love and warmth will automatically make children feel safe and secure. I have seen some parents very reluctant to talk certain religious subjects and make the children feel that these topics are taboo! Healthy discussions amongst children and parents should be the keynote to every family life. 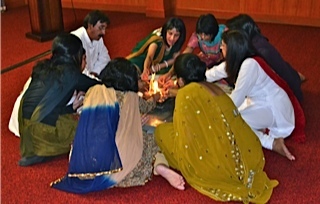 Collective living-in should be cultivated and to begin with, a common daily prayer is of utmost importance in every household: A family that prays together stays together as they say. Parents as devotees of the Ashram must ensure that children take note of the activities and allow their children to be familiar with them. They should be encouraged to assist adults in providing meals, clothing, gifts, medical help, etc to the less privileged. A feeling of compassion with humility, and at the same time an overwhelming sense of joy in serving the poor will contribute to the furtherance of the social fabric that will ultimately lead to universal love. It is the duty of parents to present a bright and shining example of a morally well-balanced and spiritual living to pave the way for their children to follow. What a noble idea of parenting distilled from the words of Lord Krishna! This posting is not meant for reading and understanding alone, though that is primarily required, but more importantly to make the idea happen with practice. The topic is so very contemporary and the discussion being the pressing need of the hour, these 26 concepts may be elaborated with case histories to motivate people to go for better parenting. First please accept my apology for belated response. I had been on a tour of Emirates to meet many of our devotees there and also participate in their cultural programs in connection with the birth anniversary of Bhagawan Sri Ramakrishna. The return coincided with the 9 day Ram navami celebrations here and I was extremely busy in hopping from place to place and hence the delay. Our scriptures are replete with innumerable examples of divine qualities to be cultivated. Fearlessness – Swami Vivekananda ghost incident & saving the boy from being overrun by horses. Charity – Welfare projects conducted by Ramakrishna Ashramas. Truthfulness – Sri Ram, Sri Ramakrishna (went to devotee’s house in the middle of the night to keep his promise), Swami Vivekananda (The classroom incident) Mahatma Gandhi. Aversion to fault-finding – Sri Sarada Devi is the epitome of this quality. All these qualities are found in many of our saints and sages whose stories are replete in our scriptures. Therefore it is important that children be taught from a very early age. We are so fortunate that today these are available in full colour in electronic and print media. We must be enthusiastic about our religion to learn and gain as much knowledge as possible to progress holistically. My most loving pranam to our Holiness Sri Swami Vimokashananda. I have had the good fortune to be one of those 500 delegates present at this celebrations and share many words from these articles with young parents. My take on parenting is to be fully present as both parents are required and to come from an authentic position in your own life, its experiences and the journey you are taking, this by implication means testing belief systems from previous generations and your parents and discarding those that have not worked in your own life and work with these in parenting your children. For me one stands out and that’s not to have any expectations from the children and to allow them to have a strong spiritual base and have the courage to live thier own life and dreams — my boys are 18 and 15 years. I’m certainly not a conformist and will make every effort to break the mould and not follow the piped piper like rats led to the sea. I send appreciation to our Swamiji for this most required topice and dialogue. Yes, We must discard any idea that is based on superstition or that weakens us, physically, morally, intellectually and spiritually. However, there is no doubt that we have to ‘let the scriptures be our authority in deciding what ought to be done’. Refer to Bhagavad Gita Chapter 16, v 23 – 24. Also we don’t have to put our hand in the fire to know that fire burns and we should not try to invent the wheel again. Let us learn from all the positive lessons that our parents have taught us. Prayer, meditation and regular study is of utmost importance and once the parents take initiative in assisting the children cultivate these three qualities, the children when they grow up, would be able to stand on their own feet. As Swami Vivekananda says that our duty is like that of an alchemist. Prakriti will play the rest. My comment and concern, from a South African culture and environment is, that in this kali yug period, it is very hard to maintain many or all 26 requirements. Just one example is “truth” which appears so difficult leading one into all sorts of trouble. Many scriptures warn that the pathway of “truth” leads one to a lonely pathway but, which is the correct one. Nowadays vices seem to rein supreme and the correct one which is welcomed by the majority laymen. These days man’s law and court cases seems to fall short per religious principles resulting in murderers, blue collar fraudsters, expert criminals and so on who use the best lawyers to get away “scott free”. On the contrary, a simple man who steals to feed his desperate family and who could not afford the hiring of a good lawyer gets convicted and tarnished as a criminal. If we look at the life of Mahatma Gandhi and all the troubles he had endured for following “truth” and, in the end eventually lost his life. Swamijee Maharaj, how does one balance these 26 qualities in order not to be alienated by friends and families? How much compromise can be allowed in order not to cross over the “ fine line” of wrong or sin. I am somehow reminded of the “Mahabarata” scenario when Arjuna stood as if alone against his friends, family and an army. Perhaps you would prefer offering me an explanation personally as my enquiry may not at times be able to be explained in simple words. Swami Vivekananda says that religion is not in doctrines or dogmas or in books. he further says that if we can take up 5 ideas and live by them we will have more religion than anyone who has by hearted a whole library. So for your first query, consider these: What is the station of your life? What are your obligations to family and to the society at large? What is your income? etc and then arrive at five principles, as Swamiji says. 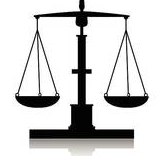 Thats how this life has to be balanced. To your second query. please note that a sincere spiritual seeker does not compromise truth for anything. Arjuna had the Lord on his side only because he was truthful and righteous. The Lord cannot be on the side of those who are unrighteous. Sometimes it seems that unrighteous people succeed but, eventually truth and righteousness MUST triumph. History is replete with examples. See the other side of the life of Gandhiji. Undergoing unending troubles and losing his life eventually did made him Mahan atma. Justifying the adharmic way of life for the benefit of pleasures of life has serious consequences spiritually. Ours is to act rightly and not worry about the results thereof. God will take care of that if we are sincere and pray to Him for help. Imbibing these noble qualities first, our parents can become role models for their own children. The kids need not run after sports or filmic icons. It is true that children follow the example of their parents. So, parents must always be aware that children are observing them. If they make a habit of regular prayer and meditation then the children too will follow. Welcome and thanks for your appreciation! The above 26 character qualities should be infused in each and every youth of India, by practicing self-analysis and mental concentration. But, how the teachers and parents will know the method of practicing mental concentration? Who is going to teach them? Youth training camps are required in each and every village of India, but how to put organized effort in this task of spreading ‘Man-making and character-building education’ among the masses as prescribed by Swami Vivekananda? Yours is a good question! Monks of the Ramakrishna Mission are an example for this. Why, the wonderful organisation that you belong to is also doing the same job – disseminating the life-giving principles of our eternal religion. Thats why Swamiji said ‘let the ideas be spread first”. By reading about the Holy Trinity and keeping in touch with the monks of the Ramakrishna Order or with the selfless volunteers of other organisations, much can be gained. Youth training camps and organized programs are already being conducted by most of the Ramakrishna Mission Centres. Other organisations like Vivekananda Yuva Mahamandal are also organising Youth Camps one of which I personally participated and overwhelmed with the response of the assembled youth. These are proving very successful especially for those who are interested and attend the programmes. Some sacrifices have to be made by those that want to learn and enlightened parents can be good propeller for the youth. In the third world country like India, the education system is too professional. There is no system for man making & character building education. In this situation as a mother by which way I teach my child? Don’t get depressed with the present situation! Many children’ books on our religion and culture are available in full colour. If it is not possible for you to take your child to an Ashrama, you can spend some time each day reading the lessons to your child. There are many methods to inculcate values in our children. Tell them the story of Dhruva, Bhakta Prahalad, Swamiji, etc. Teaching character building education has to be done daily. Even in South Africa these lessons are not taught at schools, but parents go out of their way to instill these values in the children. Some time has to be set aside for studying religion. If you live near Sealdah Rly Stn, you may visit office of Akhil Bharat Vivekananda Yuva Mahamanadal, or Contact Pramod’da on 03323524714 or 03323506898, they are working for spreading Man-making education in India since last 44 years. You should ask for the nearest Sarada Nari Sangathan and Vivek-vahini center where you and your child may attend the programmes.